Step off your first floor balcony and into the sand. 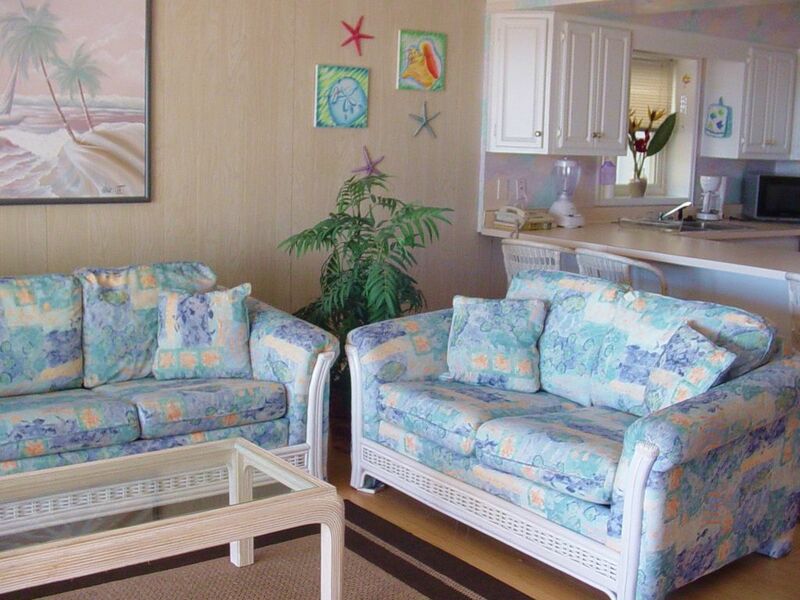 This spacious first floor 2 bedroom, 2 bath oceanfront condo opens directly onto the beach. Sweet, salty breezes and the ocean's roar greet you as soon as you open the balcony door. The large (12'x15') balcony is perfect for relaxing with your morning coffee or evening drinks . Bring a grill and you can cookout on the beach directly in front of your balcony. This is vacationing right at the dunes edge. Conveniently located off 43rd St., it is within easy walking distance of the O.C. Convention Center, shopping and many restaurants including Seacrets, Finnigan's, Taphouse, O.C. Steamers, On the Bay Seafood, Rita's, Coconuts, Dough Roller, Satellite Cafe and Belly Buster's. The unit has a fully equipped kitchen, washer, dryer, cable TV, assigned parking, central air conditioning and heat. Minimum age rental limitation. Security Deposit required. No smoking. No pets. AMENITIES: This is an upscale first floor unit with direct beach access from the 12'x15' private balcony. 2BR, 2 full bath, sleeps 6. 42' plasma TV and DVD player in living room. Stereo w/cd player. Telephone. Tropical decor including ceiling fans and beautiful bamboo floors in the kitchen and living room. Master bedroom has a king bed and 32' LCD cable television. Center bedroom has two double beds and 26' LCD cable television. Living room has queen sleeper sofa. Fully equipped kitchen with microwave oven, refrigerator, range/oven, dishwasher, garbage disposal, toaster, coffee maker, dinnerware, silverware, cookware. Central air conditioning and heat, washer, dryer, iron and ironing board. WHAT TO BRING: towels, sheets and pillow cases, soap/laundry detergent and paper products. DVD's and CD's. Bedding consists of one king, two doubles and a fold out queen size sofa. Sorry, no pets allowed. No smoking. PARKING: There is one assigned parking space directly adjacent to the building. See photos. Additional parking is available on the street to the right and left of the building. For additional pictures, rates and availability, please visit our separate web site link shown just below the calendar link below. Unit is directly on the ocean. You will see nothing but ocean, dunes, and sand from the living room and balcony. You can hear the waves break as you relax in the living room. Walk directly onto the Ocean City's BEST section of beach from your private balcony. We also have a small private beach directly in front of the unit which is great for relaxing when you want to stay close to the unit and listen to music or enjoy your favorite beverages. This is also a great area for the kids to play in the sand while you watch them from the balcony. Thank you so much for opening your home to us. Loved your condo. The view was excellent! Was definitely worth our trip. This unit is roomy and comfortable with the convenience of being beachfront!! Great place for family with a young infant. Our Daughter brought her 6 month old and being two steps from the beach was outstanding. We could come and go with very little effort. If you forgot to bring something or needed extra essentials for the baby, we were just minutes away from the condo. My family really enjoyed the stay. It is a few steps from the beach. There is a very nice patio where we sat every evening. We our looking forward to staying here next year. We absolutely loved your condo and the location. Thanks for letting us stay. We hope we can come back next year. Sorry I didn't get the chance to send this sooner, but I just wanted to say thank you for allowing us to stay in your fantastic unit!! We had an amazing vacation. The weather, beach, condo, and location were all absolutely perfect! I'm sure you have many lucky renters to look forward to in the months to come and I'm sure we will happily return for more trips in the summers to come.